We learned this song from Sandy at a Children’s Music Network gathering in Wisconsin, and we knew right away that we had to learn it. 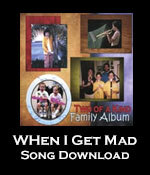 It is a wonderful song about how anger can escalate, and it seems to apply to couples and countries, as well as kids. We had fun recording this song as a klezmer-tango hybrid (“klango”).